OLFA Touch Knife TK-4B Model 9537 is a pocket-sized, multi-purpose knife that features a stainless steel blade, blade slide lock and hanging hole to easily slide on to your keychain. Can be used for a number of purposes and easily fits in your pocket, purse, desk or glove compartment. Commonly referred to as "the handiest little knife in the world." Color is Black. Ideal for use in arts, graphics, crafts and hobby for both consumer and industrial applications. 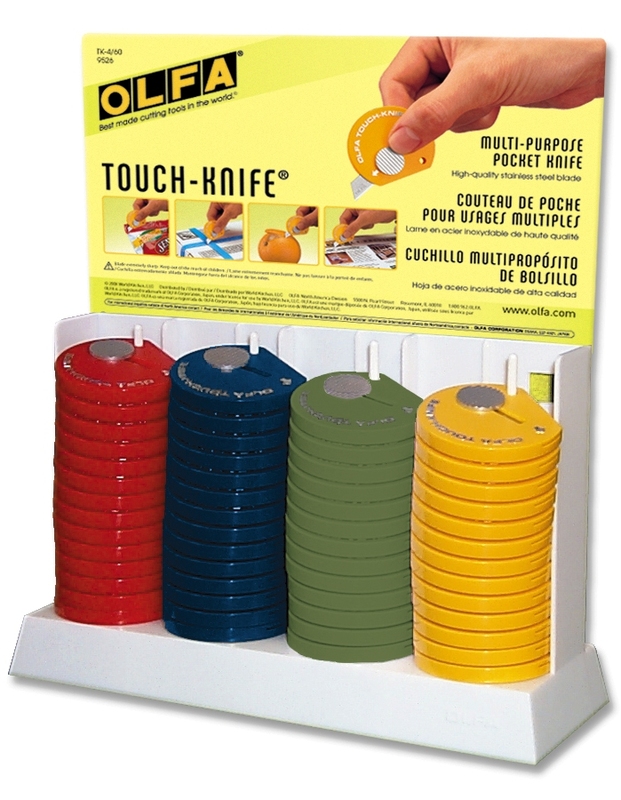 OLFA Touch Knife Display TK-4/60 Model 9584 Is A Preloaded Counter Display With 60 Touch Knives In 4 Different Colors. 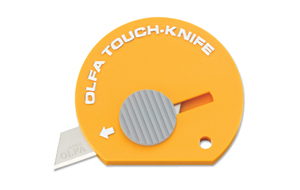 OLFA Touch Knife TK-4N Model 1083066 Is A Pocket-Sized, Multi Purpose Knife That Features A Stainless Steel Blade. OLFA Touch Knife TK-4R Model 9538 Is A Pocket-Sized, Multi Purpose Knife That Features A Stainless Steel Blade. 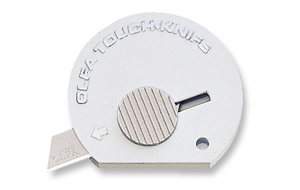 OLFA Touch Knife TK-4W Model 9539 Is A Pocket-Sized, Multi Purpose Knife That Features A Stainless Steel Blade. 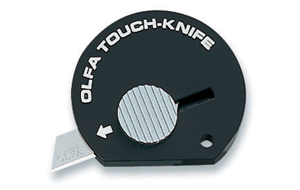 OLFA Touch Knife TK-4Y Model 9535 Is A Pocket-Sized, Multi Purpose Knife That Features A Stainless Steel Blade.